In November, our tempering furnace operator Brian D’Allemand will celebrate 20 years with Quality Glass & Mirror! Brian is responsible for setting up and operating the furnace that tempers the glass products we create. Tempered glass is four times stronger than annealed, or ordinary glass. When broken or shattered, tempered glass breaks into small, relatively harmless piece, unlike annealed glass which can shatter into jagged shards when broken. This makes tempered glass ideal for projects such as showers, windows and doors. There is an art to tempering glass just right, and Brian is the expert! He understands the unique tempering process for each different type of glass, and how to correctly program the equipment to ensure a perfect piece of tempered glass each time. He loads the piece of glass onto rollers on a conveyor which slowly moves through the furnace, heating the glass. The glass then moves through the quenching process that cools the glass. 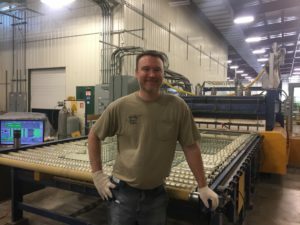 The tempering line is one of the biggest investments in the glass processing plant, and Brian is a huge asset to our team. When he isn’t working, Brian enjoys spending time with his family. We are fortunate to have him as part of the Quality Glass & Mirror team and we look forward to celebrating his 20th anniversary soon! Thank you, Brian, for being an important part of What Makes Us Work!